It was only yesterday that JPX x COARSE teased us like a stipper…..HA. If you’ve been glued to your phones via JPX x COARSE x Carnival social media last week a teaser showing a sneaker with JPX x COARSE x Carnival as a title, floating around. One can only assume a JPX x COARSE collaboration for a special release for Carnival Store in Thailand! Today we get the full revel so we don’t have to be 007. 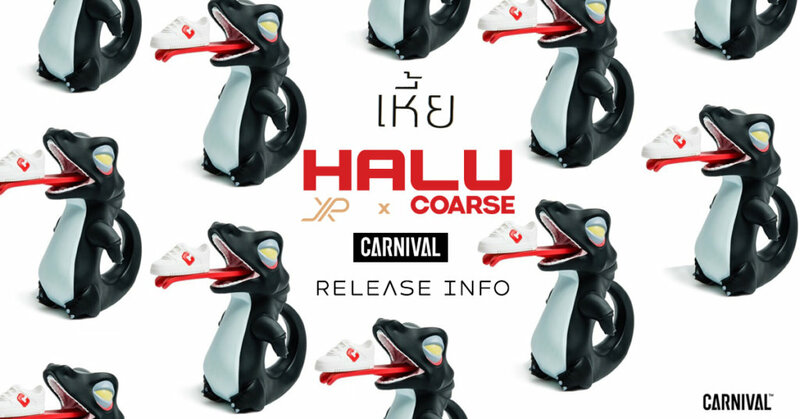 Featuring the magnet for interchangeable accessory (that’s if you own the previous 7″ Halu) Carnival is one of the streetwear stores to get an exclusive JPK x COARSE exclusive and from the photo shown today it should be a Black n Red colourway/ edition. To our surprise international order is also welcomed. Check out our unboxing of the TTE 2018 edition below. Carnival Stocks is the best in sneakers, street wear, sportswear and a little bit of local hi-end clothing brands. We have been appointed to be the launching account for Nike Sportwear, Adidas Original, Van Vault and Converse First String which some of them are the exclusive products that cannot be found anywhere else in Thailand.